The comments below were made by our customers about their experience of our products and services. You may also visit ﻿﻿Our ﻿Facebook﻿ page﻿﻿ for more comments from our customers. Customer satisfaction is our No. 1 priority. As a proud local company, we strive for excellence in every way we can, and customer feedback is integral to our business's growth and success. We appreciate your feedback and would love to hear from you. You may feel free to leave a comment on our Facebook, Twitter, send us an email, or just visit our office and let us know how you felt about our services! 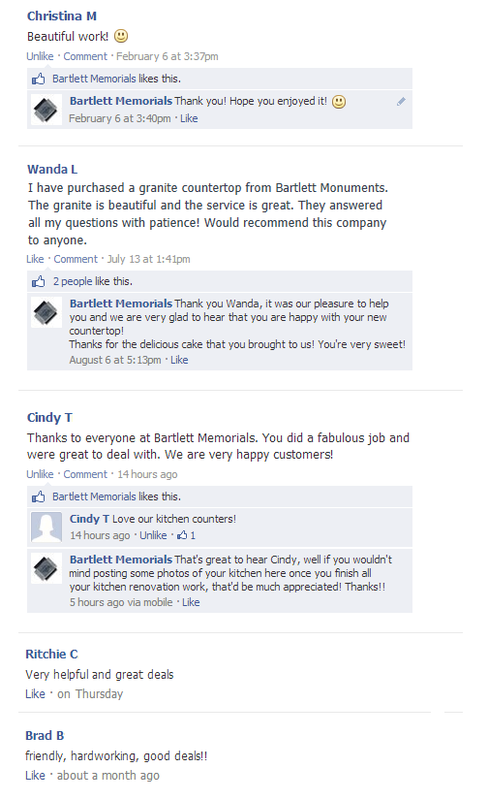 I have purchased a granite countertop from Bartlett Memorials. The granite is beautiful and the service is great. They answered all my questions with patience! Would recommend this company to anyone. Thanks to everyone at Bartlett Memorials. You did a fabulous job and were great to deal with. We are very happy customers! Very helpful and great deals!